I used to store my brushes in Anna Sui containers. As my collection grew, I started using Sigma brush holders. 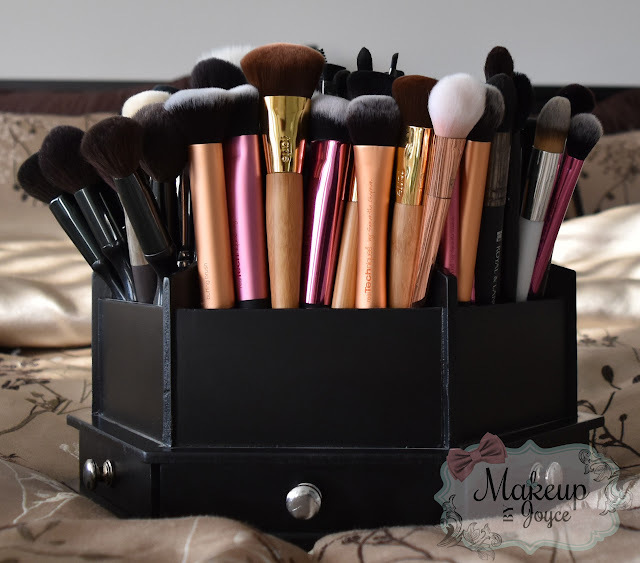 I had 8 brush holders in total, which took up alot of space on my vanity. So, I bought the Hobby Lobby Black Spinning Tool Organizer, which currently holds about 145 brushes and still has room for more! I had a 40% off coupon, but shipping was around $10, so my total came up to about $40. I heard people were able to grab this on clearance for $20 in store, but I don't have a store near me so my only option was to get it on online. Honesty, I wouldn't have mind paying retail price for this because my previous brush storage system was getting out of control. The Hobby Lobby brush holder has 12 compartments and 6 mini drawers that pull out. I use the drawers to store bobby pins and samples because it's really small and you can't fit much in there. My favorite thing about the holder is that it spins so it makes reaching for a brush alot easier. 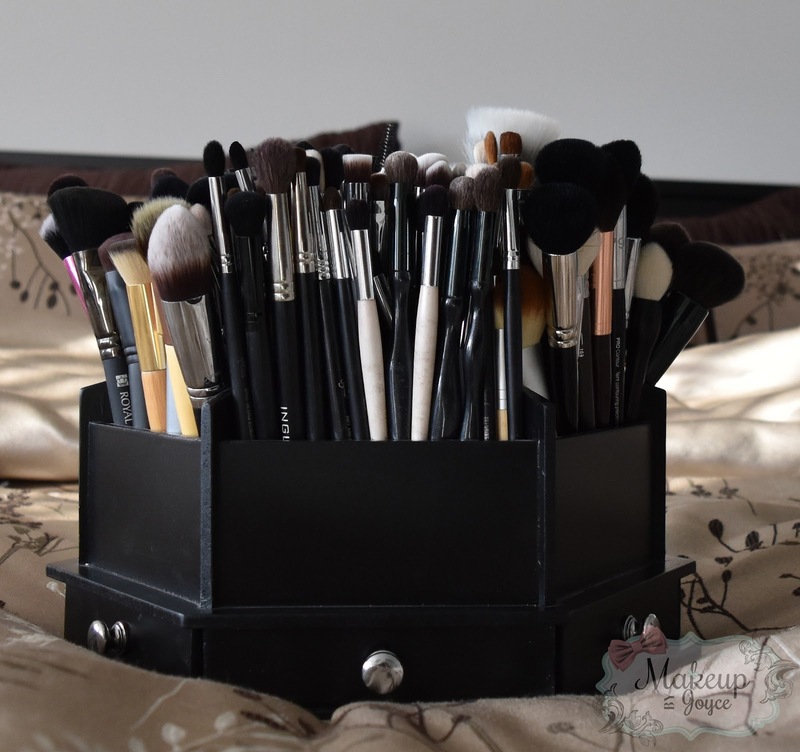 As for my kabuki brushes, I used to store them on my vanity, but that took up space. So, now I store them in my drawer. One of the reasons why I have alot of brushes is because I dread washing them. It's a real chore. I do it once a month or sometime once every 2 months if I get that lazy. When I use brushes for powder products, I'll use it a few times before I transfer it to the dirty brush pile in my ELF brush holder. When I use brushes for liquid products, I'll use it only once and then it goes straight to the dirty brush pile because of sanitary reasons. (It's alot easier for bacteria to grow in wet environments). They'll sit in the dirty pile for a month or two and then they'll get washed. I wouldn't be able to do this if I didn't have a big brush collection. Note: The Hobby Lobby Black Spinning Tool Organizer retails $49.99. The ELF brush holder retails for $15 on their online store and Target. 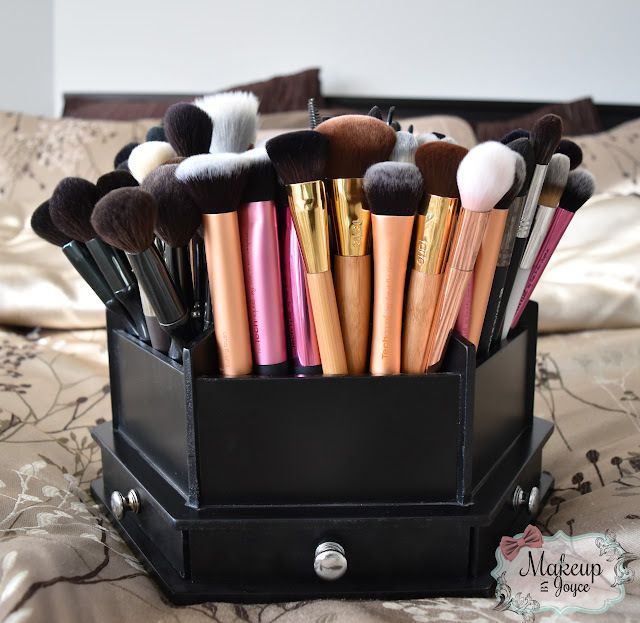 How do you store your brushes? *This post contains affiliate links. All products were purchased by me, using my own funds. wow, I love how you store your brushes! you've got so many and I'm a bit jealous! so glad you started to write again! Thanx! I've been taking a break, but I'm back for good =) Miss all of my readers! !